Developed by Land & General Bhd back in the 1990s, Bandar Sri Damansara is becoming increasingly affluent. 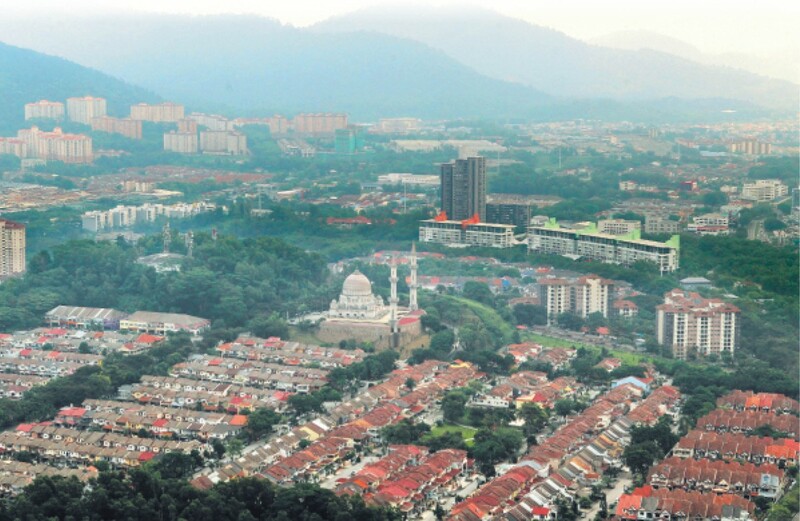 The 1,200-acre freehold township is located on the border of Kuala Lumpur and Selangor, 15km from Kuala Lumpur City Centre and 14km from Petaling Jaya. Comprising residential, commercial and industrial areas, the suburb is surrounded by townships such as Sunway SPK, Desa ParkCity, Bandar Menjalara, Damansara Perdana and Damansara Damai. Metro Homes Sdn Bhd director See Kok Long says one of the initial attractions of Bandar Sri Damansara was the Sri Damansara Club. It was one of the few townships in the area that offered a clubhouse. According to Tang Chee Meng, Henry Butcher (M) Sdn Bhd chief operating officer, property prices in the suburb have remained firm since 2013, despite a slowdown in the overall property market in the Klang Valley, which has seen a decline in the volume and value of transactions. “The medium-term outlook for Bandar Sri Damansara, being a mature and established township, should be stable, although new projects will see a slower take-up rate, as in most areas in the Klang Valley. For the long term, it is looking good, especially when the MRT2 Sungai Buloh-Serdang-Putrajaya (SSP) Line is completed." The first phase of the SSP Line is slated to be operational by July 2021 and the entire line is expected to be ready by July 2022. Tang adds that when they are completed, the two MRT stations planned for the area — Sri Damansara West and Sri Damansara East — will improve public transport and accessibility in the area. LaurelCap Sdn Bhd director Stanley Toh says the suburb’s overall property market is still climbing but at a slower pace than during the bull run between 2011 and 2013. “This [slower growth] will continue in the medium term. But for the long term, the outlook for the area is still positive,” he says. Compared with major townships nearby, such as Desa ParkCity, Damansara Perdana and Taman Tun Dr Ismail (TTDI), See says Bandar Sri Damansara has not performed as well due to its location and terrain, which is less attractive for the commercial segment but suited for residential projects. Property prices in the township remain comparatively lower than neighbouring areas as it lacks gated and guarded residential enclaves and has fewer retail offerings. But the lower prices also mean that “in the current market, homebuyers can find good deals in the area without the need to rush into a purchase. Moreover, the area looks promising in the medium to long term as it is a prime location offering relatively affordable properties”. He says the well-planned, mature township, coupled with its strategic location appeals to many. In terms of value, properties in Bandar Sri Damansara compared favourably to those in Damansara Perdana, but not Desa ParkCity and TTDI. Property prices in Desa ParkCity are higher while TTDI is an established, prestigious housing scheme with limited new development, Tang says. Nonetheless, Toh says property sales in the past two years have been been more active than at Desa ParkCity and TTDI, which have become more expensive and transaction volume has dwindled. Recently completed and ongoing developments in Bandar Sri Damansara include Azelia Residence and Ativo Plaza, both in Damansara Avenue (developed by TA Global Bhd), and Damansara Foresta (by Land & General). Set on 48 acres, Damansara Avenue is set to be completed in 2020. Ativo Plaza and Azelia Residence were launched in 2010 and 2011, respectively, and completed in 2013 and 2014. Damansara Foresta was launched in 2013 and completed at the end of last year. Bandar Sri Damansara’s earlier residential zones are made up of terraced houses, semi-detached homes and bungalows. Apartments and condominiums came later. “The township is designed as a residential community with good access roads, facilities and amenities. It also has freehold tenure. Demographically, the area is made up of families, newlyweds and single adults,” says Toh. The current prices of terraced houses in Bandar Sri Damansara range from RM450 to RM500 psf and semi-detached houses are RM550 to RM600 psf. The average transacted price of terraced houses in the suburb was RM681 psf in 2015, up from RM458 psf in 2011. “Two-storey terraced houses are the best performing landed properties in terms of capital appreciation. The reason is because it does not look like there will be anymore developments of terraced houses in the area or its surroundings,” Toh says. “Malaysians generally prefer to live in landed property with a big built-up and a nice garden. As most one-storey terraced houses are too small and bungalows are too expensive, two-storey terraced houses strike the right balance. But it very much depends on other factors like the homebuyer’s budget,” he adds. Similarly, Metro Homes’ See says terraced houses are the most popular in the area, especially the two-storey units priced below RM1 million. Two-storey terraced houses with a land area of 1,650 sq ft are being transacted at around RM900,000 to RM1 million, up from RM650,000 in 2010, and are seeing an annual appreciation of 15% to 20%. “The rise in property values is due to the improvement in overall market performance between 2010 and 2015, coupled with easy credit facilities and global inflation,” See says. As for rents, See says terraced houses in the suburb can fetch RM2,000 to RM3,000 per month, for yields of 2% to 3%. In general, landed properties in Bandar Sri Damansara provide a rental yield of between 3% and 4% per annum, Toh says. According to Tang, an example of a development in Bandar Sri Damansara that is performing well is The Aerie, a freehold gated and guarded residential development that was completed at end-2013. It comprises 74 units of three- and 3½-storey semi-detached houses, zero lot houses and bungalows and comes with clubhouse facilities. Launched at a starting price of RM1.8 million, current prices start from RM2.2 million or RM500+ psf for the zero lot houses, RM2.3 million or RM600+ psf for the semi-detached homes and RM3 million or RM600+ psf for the bungalows. Tang notes that The Aerie is currently fetching rents of RM7,000 to RM8,000+, providing yields of 3% to 4%. Bandar Sri Damansara’s industrial zone, meanwhile, comprises terraced factories, semi-detached and detached factories. Toh says prices of the industrial properties have been moving upward and there is a strong demand for the terraced factories. The more popular high-rise developments in Bandar Sri Damansara are SD Apartment 2, Paradesa Rustica, Paradesa Tropica, SD Tower and Azelia Residences at Damansara Avenue, according to the consultants. SD Apartment 2 is located near schools, shops and bus stops. Units are currently selling for RM250,000 to RM350,000 or an average of RM350 psf, says Toh. Prices at Paradesa Rustica range from RM450 to RM500 psf or RM350,000 to RM560,000. “Paradesa Rustica is among the higher range of condominiums within Bandar Sri Damansara. It is located on a hill overlooking the New Klang Valley Expressway (NKVE) and it is quite popular among middle-income earners as it is a newer development, yet cheaper than the new condominiums,” he says. See says that Paradesa Tropica (Phase 2) and SD Tower are well-located and offer some units with a forest view. Paradesa Tropica (Phase 2) is transacting at around RM450 to RM500 psf for units of 800 to 1,100 sq ft in size and SD Tower RM420 to RM450 psf for units of 1,000 to 1,200 sq ft.
3,433 sq ft, and currently fetches rents of RM2,200 to RM5,000 or RM1.70 to RM3 psf. High-rise developments in the area that are transacting below RM500,000 include SD Tiara, SD Tower, Sri Damansara Court, Sri Meranti and Menara Damansara, Tang says. The general price trend of high-rise developments in Bandar Sri Damansara has increased by RM300 to RM350 psf compared with five years ago. The asking prices of new condominium launches in the area, such as at Damansara Avenue are around RM550 to RM700 psf, according to See. He says the older condominiums, which remain relatively cheaper, still attract owner-occupier buyers. For example, current transacted prices in the suburb range from RM350 to RM500 psf for built-ups that are usually below 1,500 sq ft, says Toh. He adds that the average transacted price has risen to RM370 psf in 2015 from RM190 psf in 2011. The rental yield for high-rise properties in the area ranges from 3% to 5%. See says that rents are about RM2,000 per unit, and Toh says SD Tiara has the highest average yield of 4.5% to 4.9%. “Generally, property investments in Bandar Sri Damansara are for the medium- to long-term while potential homebuyers should look at landed properties in the area. For those interested in high-rise living, it is advisable to look at new developments as older properties may have maintenance and management issues,” See says. The first commercial properties in Bandar Sri Damansara comprised three-storey shophouses. Newer office buildings and shopoffices started to appear in the last five to seven years, Toh says. The commercial areas, See says, are screened from major roads and highways (such as Jalan Kuala Selangor and Lebuhraya Damansara-Puchong [LDP]) by the terrain, making them less appealing to investors. Nonetheless, the old shopoffices in Persiaran Perdana are a popular commercial destination while the newer 8trium and Ativo Plaza are quickly gaining popularity, he adds. “Places like Ativo Plaza add a new lifestyle element to Bandar Sri Damansara, which is good for the township. It is a relatively new product that was completed in 2013. Its prices have been appreciating at a rate of 10% to 15% in the past two years,” See says. Transacted prices at Ativo Plaza range from RM580 to RM700 psf. On the whole, the suburb’s commercial properties saw an average transacted price of RM478 psf in 2015, up from RM275 in 2011, while asking prices are about RM550 psf, says Toh. He adds that their average prices are from RM500 to RM530 psf. Asking prices for the two-storey shophouses currently range from RM1.5 million to RM1.6 million and for the three-storey shophouses, RM2.8 million to RM3 million. Four-storey shophouses are priced between RM3.2 million and RM3.3 million, according to Tang. Toh says shoplots are the best performing commercial properties in the area due to the mature residential segment. “Ground floor units of the shophouses enjoy 80% to 90% occupancy,” he says. “However, office units, including those within the shopoffices, are performing more slowly and it will take some time for them to be absorbed by the market. Hence the demand for retail units or shoplots in the area is still strong,” he says. Bandar Sri Damansara enjoys accessibility to highways such as the LDP, Penchala Link, NKVE, North-South Expressway and Middle Ring Road 2. It is also near major shopping centres like 1Utama, The Curve, IPC, IKEA, Tesco and the upcoming Empire Damansara. “Although its amenities are similar to those at neighbouring townships, its location after the LDP toll makes it a bit more costly for residents to access major amenities located in Mutiara Damansara, Bandar Utama and TTDI,” See says.